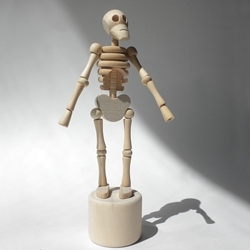 Lazy Bones is a wooden skeleton focused on form and movement. This classic string puppet is stripped down to its bones to provide entertainment and insight. Simply press the button at the bottom of the base to make Lazy Bones collapse, dance, and move. We think he's just plain neat. Also makes a great addition to your wood art manikin collection; use him in your still life compositions or as a great studio sculpture! Lazy Bones is approximately 7.5 inches tall.